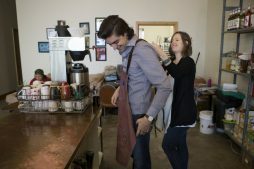 Jamie Hembree helps her husband Aaron put on his apron as they open their shop, The Gathering Place Coffee Co., in downtown Shawnee, Oklahoma. Aaron and Jamie Hembree celebrated the opening of their downtown Shawnee, Oklahoma, coffee shop in November. The Gathering Place Coffee Co. is a lifetime dream for Jamie, she recently told the Hownikan. Its interior is bright — large windows and high ceilings usher sunlight into their roomy business. Coffee specialties include espresso, Americano, drip coffee, cortado, cappuccino, latte and mocha. Add-ins are honey and agave. The Hembrees also serve hot cider, kombucha, lavender lemonade, organic Hugo teas, matcha and vegan Golden Milk. Baked goods for sale often include cookies, cream puffs, mini bundts, tarts, quiches, cinnamon rolls, muffins, crullers and scones. The bakery nested inside the shop, Redbird Baking Company, is owned and operated by Cassie Osborn. The building also contains Rise Yoga Studio run by Stevi Simmons. There’s a renaissance of sorts happening along Main Street as newer businesses move in next to older ones, filling empty storefronts with shoppers, diners, friends and neighbors. “There wasn’t even a roof on this building when we started. It wasn’t even really a building,” Jamie said, then laughed. “All of it is new; a labor of love. “The only remaining part of the building is this one wall,” she said as she spread her arms wide. A large, cream-colored couch sits in front of it, draped with a blanket and cushioned with oversized pillows. On an antique stand next to it sits a portable record player. Aaron adds, “We’ve never been financially driven.” Their motivator is authenticity. Rich, poor, regulars, passing through, it doesn’t matter, he said. Everyone’s welcome. The venue features free Wi-Fi, a free meeting room, an event space they rent out for $20 an hour and even a clothes washer and dryer and a shower for visitors who might need them. The Hembrees also seek out high-quality local and regional goods. The java is Topéca Coffee Roasters, a company based in Tulsa. Most of Topéca’s family farmed, shade-grown beans arrive at the Tulsa roastery from El Salvador. The honey customers use is sourced from Tulsa’s John 3:16 Mission. Its BeeLoved Trading beekeeping project saves bees, teaches vocational skills to underserved and homeless populations and helps fund John 3:16 Mission. Hugo Tea Company is based in Kansas City. Marak Family Farm in Meeker sources the milk. Local artists created the artwork hanging on the walls. Area singer-songwriters perform during a monthly Third Friday Block Party, and the musicians earn a portion of nightly sales revenue for doing it. “Everything else is us. By that, I mean the community — we’re the community,” Aaron said. The Gathering Place Coffee Co. co-owner Aaron Hembree makes a latte in his downtown Shawnee, Oklahoma, shop. Aaron is a CPN tribal member and descendant of the Ogee family. 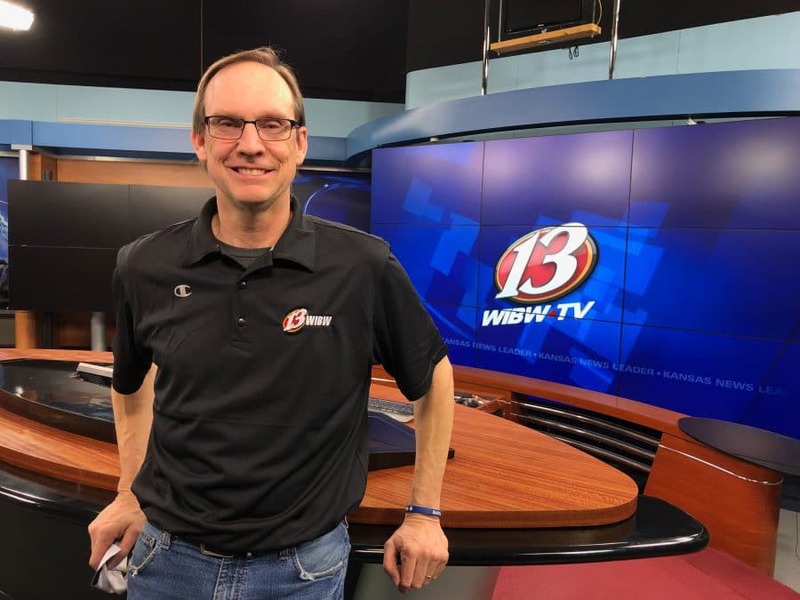 He grew up in Shawnee, where his dad worked as a church deacon. Today, Aaron’s studying Systematic Theology at Southwestern Seminary at Oklahoma Baptist University, working on his master’s degree. Jamie was born in Sacramento and graduated from Maysville High School. The couple met while studying engineering at Oklahoma State University in Stillwater, Oklahoma, and married in 2012. They then lived in Tulsa about three years before moving “home” to Shawnee. Their first baby is due in June — the week of the Potawatomi Family Reunion Festival, in fact — although they’ve already “raised three foster kids who are now in their 20s,” Aaron said. A very brief silence followed before Jamie and Aaron both explained that the children — ages 15 and 16 — lived in their home and “aged out of the system before the adoption could be finalized. But they’re still our kids. We see them a lot and deal with a lot of the same things parents always deal with,” Jamie added. 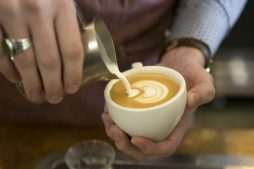 Eventually, the couple hopes that The Gathering Place Coffee Co. earns enough to help fund a sort of “group home,” offering foster care support and someday building homes in which families can foster and host hard-to-adopt sibling sets, keeping the children together. When they both say it can be done, it’s easy enough to believe they can help make it happen. In the meantime, they’re strengthening their community by building partnerships. Within walking distance of the Hembree’s shop are art galleries, restaurants, antique shops, gift boutiques, a pet boutique and residential loft construction continues nearby.